Today is my birthday and so I have been in the kitchen cooking a gluten free and dairy free cake for tonight. I also planned on buying a small cake that everyone else can eat. I have to say it has been a feeding the soul morning - not sure the product will feed the palate tonight? I have cooked egg free cakes before with mixed success but I have never done this kind of cake before it is essentially a paleo cake. 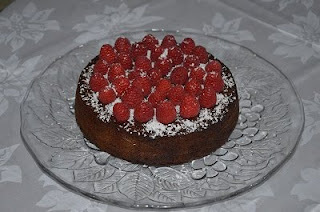 Where did it go wrong - I hate "flat/low" cakes so as I didn't have a 22 cm pan I chose to use my 20 cm pan over the 23 cm pan. I knew it would take longer to cook but the edges may too brown due to the high content of honey. Now I wait as the cake needs to cool completely in the pan. As they say the proof will be in the cooking eating, if we eat it at all! Thank goodness I was planning on getting a second cake of those not dietarly challenged. Soooo relieved and pleased that the cake was moist and scrummy! A wonderful cake that I could eat to cater for my dietary needs. The young drivers in the household have however requested that next time to leave out the port so they can eat it without worry about a zero blood alcohol level for driving.